As a merchant, if you’ve gotten a customer to the checkout line, it’s likely that you’ve done a good number of things right—attracted the right customer, proven yourself a trustworthy business, offered a desirable product, and provided the information and support necessary to close the deal. But it’s too soon for a congratulatory “job well done” because the job isn’t quite done! Accepting payment is a critical component of the transaction—one that wields the same power as every other step. If it’s not handled properly, the deal could easily fall through. For eCommerce merchants in particular, the matter of how to accept payments online should be considered part of your overall business strategy. Not only are eCommerce transactions naturally more complex than in-person transactions, they’re also nudging out in-store purchases for their share of the payments pie: In 2016, 54% of total purchases made by millennials (ages 18-29) were made online; for nonmillennials, it was 49%. Those numbers are expected to keep climbing. That’s why we’ve put together this guide on how to accept payments online. Merchants that understand the complexities of online payment processing will be in the best position to help their businesses succeed. 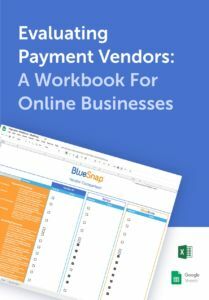 It’s our goal to help you reach your goals—so we hope this guide comes in handy as you define your own online payment processing needs and head off in search of solutions. If you have questions that are not answered in this guide, give us a shout here at BlueSnap! There’s always someone who can help. Where Do You Want To Reach Your Customers? What Is Your Preferred Integration Method With A Payment Provider? What Functionality Do You Want/Need For Your Preferred Integration? There are really two sides of online credit card processing: the side that impacts your customers and the side that impacts you, the merchant. An account is required for checkout—35%. A too-long, complicated checkout process—27%. A lack of trust in the site’s security—18%. Some abandonment factors (like a website that crashes or an unsatisfactory returns policy) can be controlled by you, the store owner, and your store policies and practices. Other factors—like the reasons for abandonment listed above—are related to online payment processing. For example, a good payment processor21 can help you offer the right payment methods and reduce the rate of credit card declines. That’s why it’s important to know what to look for when it’s time to shop around. Want to see how your checkout process stacks up against your competitors? Take a few minutes with our simple checkout conversion calculator to find out! For you, the merchant, the right payment service provider can make your life easier and help your business grow. For instance, mobile shopping (coined “m-commerce”) has gained so much traction as of late that it now drives one-third of all eCommerce; how your payment service provider handles mobile credit card processing matters if you hope to capitalize on the trend. The same goes for digital wallets,13 payment options that consumers have come to expect. At its most basic level, a payment gateway provider enables merchants to process credit, debit, and alternative payments. The term payment gateway refers to the technology that allows that to happen, enabling merchants of all kinds (not just online merchants) to accept electronic payments in exchange for goods or services. The payment gateway then submits the merchant’s transaction to an acquiring bank,2 or an “acquirer,” such as Wells Fargo, for example, for processing. The acquiring bank then submits the transaction to the appropriate card network (Visa, MasterCard, Amex, or Discover). The primary role of the card network is to route the transaction to the bank that issued the credit card or debit card12 presented by the shopper. The issuing bank16 assesses the request. The bank’s assessment takes into account several things, including whether the shopper has sufficient funds and whether or not the transaction appears to be valid (not fraudulent). The issuing bank returns a response (approve or decline) to the card network, which then passes the message back through the acquirer and to the payment gateway. Finally, the payment gateway presents the result to the merchant. Depending on the result, the merchant may either direct the shopper to a confirmation page or ask them to provide another form of payment. And all of the above happens in about a second! While the payment gateway performs what appears to be a fairly straightforward function, the top payment processing companies combine online credit card processing with a little something extra—the “special sauce” that sweetens the payment process. Keep reading to find out what your payment gateway services should provide that can help boost your business. It’s important to understand that accepting a credit or debit card as a form of payment is not the same thing as getting paid! The payment gateway’s primary role is to facilitate payment acceptance or get approval for the merchant to collect funds from the shopper’s account. But that’s only half the eCommerce transaction equation. The other half revolves around how you actually get paid. You can’t accept payments online without a merchant account. It’s not like a checking or savings account; it’s simply a place for transaction proceeds to be distributed before they are transferred into your business bank account. Not all payment gateways provide a merchant account. If yours does not, that means you’ll have to work with a second company that will provide one (which means a separate application process) and have it linked to your payment gateway account. Here’s how a merchant account works: After a transaction, it typically takes anywhere from 2-4 days for funds from the shopper’s account to reach your merchant account. After that, your merchant account provider transfers the money into your business bank account. How quickly it gets there depends on the payout schedule you’ve worked out with your merchant account provider. It might be daily, weekly, or even monthly, but the decision should be dependent on what makes the most sense for you, the merchant—not the merchant processing company. A transparent underwriting25 process. There’s a certain level of risk involved in providing online merchant account services (some funds will inevitably have to be paid back due to returns), and that level of risk varies from one merchant to the next. Look for a gateway provider that is upfront with you about how they underwrite accounts and can explain how and when they will ask you for additional information. Choosing a provider that requests only a few pieces of information at the outset might be the easiest way to start processing, but beware: You could run into trouble down the road. For instance, you may not be able to actually get paid until you satisfy additional requirements. (Remember, processing payments and getting paid are two different things!) In the meantime, your account could be frozen. The ability to set up multicurrency accounts. If you plan to accept global payments, your online merchant account provider should give you the ability to accept multiple currencies in your merchant account. The option for dedicated or aggregate merchant accounts. Some online merchant account providers create a single account that is shared among all of their customers. This means that your risk profile is blended with all the other merchants in the pool. That may or may not be an advantage for you, so consider the implications before you commit. You’ll need both a payment gateway and a merchant account for online credit card processing—but not all payment gateways provide both! To make your life easier, look for a payment service provider that sets up eCommerce merchant accounts for its customers as a matter of course. Take a look at our website to learn more about payment gateways and merchant accounts. With a mechanism in place for online credit card processing, you’re now well on your way to being able to accept payments online. But your online payment system should be doing a lot more for you than simply acting as a go-between for merchants and payment networks. A truly powerful payment gateway can have a real impact on the experience you provide for your customers and can even sometimes mean the difference between making a sale or not. It can also help your business grow, giving you the tools you need to not only accept payments online but also expand into new markets and offer more sophisticated payment options. How do you plan to integrate with your payment gateway solution? What functionality do you need/want for your preferred integration? Do you sell to consumers or businesses, or both? Depending on the answer, your business may have different requirements for online credit card processing. If you’re selling to businesses (business-to-business), you not only need a way to accept payments online, you may also need a way to accept payments on the phone or via email (a virtual terminal), or a method for collecting invoice payments. If you’re selling directly to consumers (business-to-consumer), your priorities for an online payment system lie elsewhere. For you, the best way to accept payments online might include a traditional online checkout form; it’s also important to offer the latest consumer-oriented payment solutions like mobile wallets. It goes without saying that you’re looking for a pain-free checkout experience either way, but the solutions used to achieve that goal will look different depending on your customers. Do you sell directly to consumers/businesses, or do you run a marketplace eCommerce business model? Security and simplicity are essential for how any business accepts payments online, but depending on your business model, your needs beyond that may vary. Those with a marketplace model17 (where your service or product is provided by one or more third parties) benefit from additional payment gateway solutions like real-time split payments, vendor management, and easy onboarding for new vendors. Enhanced reporting features help keep track of multiple vendors and the details associated with each. Consider how your business model impacts your payment process and make sure your online payment service provider has you covered. Is your payment gateway working hard enough? Take this quiz and rate it now! Learn more about how your marketplace business can accept payments online. If you’re selling digital goods or services, you have different payment needs than merchants that sell physical goods. In addition to being able to accept payments online, merchants selling digital goods have special considerations when it comes to managing subscriptions and preventing fraud. They also have more options for getting their content into the hands of consumers. On top of standard online credit card processing, make sure your payment gateway services include other things you might need to offer a superior checkout experience tailored to your company. Learn more about accepting payments online for digital goods. The services you need will vary according to whether you accept payments over the phone or accept payments on your website. It doesn’t have to be that way! Many mobile payment platforms leave a lot to be desired, but top-notch mobile-oriented payment companies can help solve a number of problems related to subpar mobile payment19 experiences. The availability of mobile wallets as a payment option makes mobile checkout superior to traditional online checkout. Plus, the mobile payment platform you use should enable you to make the mobile checkout experience consistent with that of your other sales channels, making customers more willing to complete a sale on their mobile device. Finally, the availability of a mobile payment API (see the question below) gives you complete control over the checkout experience while passing off the transaction processing load to your payment gateway provider. Are you getting the idea that you need way more than a simple mobile credit card processing company? Consider what you need now—and what you might need in the future—so you partner with an online credit card service that gives your business room to move. A payment API integration (API4 stands for application programming interface) is the best solution for merchants who want to maintain control over the shopper experience from start to finish. (When it comes to brand messaging, being controlling is a good thing!) That’s because the payment API works behind the scenes of your existing website—shoppers never leave your site to fill out payment information—allowing you to keep your carefully constructed brand image consistent throughout. Using a payment gateway API integration, the payment gateway provider manages all the tasks necessary to complete the transaction. This type of integration still allows you to accept a range of payment types, including credit cards, debit cards, digital wallets, and ACH; a mobile payment API does the same for your mobile app. Either way, you maintain control of how the checkout page looks and feels. That means you can keep customers firmly embedded in your brand experience while serving up an equally high-quality checkout experience. Your credit card payment gateway could be to blame for disappointing conversion rates. Check out this ebook to find out how easy it is to switch to a more powerful gateway provider. Tools to meet industry security standards. If you decide to go with a payment API, you will be required to meet certain security standards to show that you can securely manage your shoppers’ payment data. (If you’re a sucker for acronyms, this concept is technically called PCI20 compliance.) But you shouldn’t have to go it alone! Ask your payment service provider how they plan to help shoulder this burden. For example, BlueSnap offers client-side encryption, a way of encrypting payment information before it reaches your servers; we also have hosted payment fields, which means that we’ll handle sensitive payment data—not you. Software development kits (SDKs). Does the payment API offer SDKs designed for specific eCommerce purposes (for example, an SDK that allows you to accept payments from a specific app and process the payments via the API)? The availability of SDKs make a developer’s job even easier and help facilitate using the payment API to suit your individual needs. Detailed documentation. Developers shouldn’t have to jump through hoops to get the information they need, so make sure your payment API caters to developers. While some complex integration issues might require reaching out to the payment provider, most of the answers to developers’ questions should be thoroughly documented online. Tools to test the code. Most gateways have a sandbox environment that allows merchants to test their integration before processing live transactions. The most innovative providers however, will have tools (usually embedded in their documentation) that allow merchants to test various API requests and responses without ever opening an account. A current/modern design. The technology associated with payment APIs is constantly changing, and the one you choose should have the most current design. Today, that standard is “REST.” Not only does the use of current architecture indicate that the payment gateway is committed to ongoing technological improvements, it also ensures that the API will be easier for developers to integrate. Of course (it almost goes without saying, but we’ll say it anyway! ), your payment processing API should support a wide variety of payment types—if you’re accepting payment by credit card your system should accept multiple types of cards. To meet the needs of even more customers it should also accept ACH1 payments, debit cards, digital wallets, and PayPal. Learn more about payment APIs here. If you don’t have a development team to implement a payment API (often the case for small businesses or startups), a hosted checkout page is a great way to accept payments online. These prebuilt checkout forms can be easily embedded into your site—no development experience needed. With hosted checkout, your customers click a “buy” button on your site and are directed to a secure payment page hosted by the payment gateway provider. On-page hosting enables you to set up a hosted pay page directly on your website. Or, you can choose to display the payment page separately (a redirect), in which case there should be options available for customization, like adding your merchant logo and adjusting fonts and colors to match the look and feel of your site. The goal is to make checkout as simple and seamless as possible while still inspiring confidence in the checkout process. Another benefit of having a hosted payment page is that all the payment data associated with online credit card processing is captured7 directly by the payment provider. You don’t have to worry about storing sensitive card information on your servers, which means your PCI compliance requirements are dramatically reduced. If you plan to go this route, find out what features your online payment gateway provides for a hosted solution right “out of the box.” Make sure the solution is robust enough to give your business what it needs to succeed—not just the minimum to accept payments online. It should support a variety of payment solutions, give you the ability to design custom form fields, and support both mobile and desktop browsers. Other things that should make your top 10 list for online and mobile credit card processing: support for subscriptions, one-click checkout, multiple languages, and multiple currencies. Learn more about how to accept payments online via hosted checkout pages here. Even if your business takes sales orders by phone, mail, or email, you can still accept payments online with the help of a virtual terminal. This type of integration works especially well for customer support reps or sales teams. The virtual terminal works on the same concept as the hosted payment page, except that you, the merchant, accept payments online by placing the orders for your shoppers yourself. Alternatively, you can create a secure “Buy Now” link and send a form via email, where your customers can fill out payment information themselves. After entering the information, they’ll submit payment whenever they’re ready. You should be able to configure a virtual terminal to collect only the information you need, and customize it with any branding elements that appear on your website. Learn more about how to accept payments online via virtual terminal. It’s common for eCommerce merchants to run their businesses on one of the many eCommerce platforms available—WooCommerce (for WordPress), Magneto, PrestaShop, BigCommerce, and many more—but they still need a way to accept payments online. If that’s the case for you, then you may want to integrate with your online payment gateway via your preferred shopping cart. Look for a payment gateway provider that partners with multiple popular eCommerce platforms to make sure that your current needs for online credit card processing are met. And as your business evolves, you’ll want options to consider in the future. Aside from the technology you’re using to accept payments online, you might also be using an accounting system, a marketing system, a customer relationship management system, or some other type of business software to help get things done. The online payment system you choose should have the ability to integrate directly with business technology providers like these. Let’s say you’re using NetSuite for invoicing. The software generates an electronic invoice and sends it to the customer, who then clicks a “Pay Here” link taking them to a secure payment page provided by yours truly—the online payment gateway. Or, if you’re using a vendor for managing subscriptions, you can set up all of your subscriptions there and connect that system to your online payment processing system, which handles the actual charges. NetSuite, HubSpot, Zuora, and Salesforce are just a few of the most popular business technology solutions on the market, but you’ll need an online payment processing company that has your back whatever vendor you happen to use. You may need help preventing fraud. You may need tools that enable cross-border eCommerce. You may need a way to handle subscriptions. You may need to expand your menu of payment methods. All of these can be solved with the right payment gateway provider. As you research different gateways for accepting payments online, evaluate each on how it will get you where you need to go. Keep in mind, too, that your situation may change in the future. You don’t have a crystal ball to know exactly what you’ll need down the line, but it’s better to work with a payment service provider from the get-go that can easily give you additional functionality as new opportunities arise. Let’s take a look at some of the online payment processing tools that can help solve business problems and increase conversions at the same time. Even if you’re not currently selling overseas, it’s imperative that you consider the potential for cross-border sales if you hope for your business to be successful well into the future. The global eCommerce market is worth $22.1 trillion and will only become more significant as trade barriers come down and competition heats up. Download this free guide for strategies to maximize your global ROI, including six essential measurements for cross-border eCommerce success. 1. Multilingual checkout pages. Seventy-five percent of shoppers prefer not to make a purchase decision unless the site is presenting in their native language. So when a shopper in France discovers your U.K. site and wants to make a purchase, not only do you need to be able to accept that payment online, your payment gateway should automatically detect the origin of the URL and serve up a payment page in French. Doing so lends more legitimacy to your brand and helps boost consumer confidence. According to the X-Border Payments Optimization Index, your website should be accessible in at least six languages. 2. Support for local currencies and payment methods. Similarly, the price of your goods should appear in the shopper’s local currency. This is important for two reasons: One, it helps your customer to know exactly how much they’ll be paying—without making them jump through hoops doing currency conversion calculations. (We can’t all be math geniuses.) Two, if the purchase currency matches the currency of the shopper’s credit card, it’s more likely that the transaction will be approved by the issuing bank. Again, a simple URL check by your online payment gateway should provide the shopper with what they need immediately. A truly global payment system supports at least six global currencies. If your payment gateway solution is truly supportive of global payments, your merchant services should also include the ability to accept credit cards that are local to the shopper’s geographic area. The more options you offer for cross-border payments, the better your chances of attracting (and keeping!) international customers. 3. A global network of acquiring banks. Remember the acquiring banks we mentioned as part of the basic process of accepting payments online? They actually play a critical role in your conversion rate. Many credit card processing companies are only connected to one acquiring bank, which has its limitations. If that particular bank declines a transaction or fails to pass it on to the card network for one reason or another, that transaction has reached the end of the line. So you can imagine that a one-bank partnership sets up global payments for failure. If the acquiring bank is located in the U.S. but the shopper’s bank is in another country, that transaction has a much higher probability of being flagged for fraud by either the acquiring bank or the issuing bank. Look for a payment gateway that can connect you to multiple acquirers in each of the countries or regions where you want to do business. These connections can support two important solutions—intelligent payment routing15 and transaction failover. Providers that intelligently route transactions as part of their online credit card processing use data to make sure they send each transaction to the acquirer most likely to generate an approval from the issuing bank. A sister feature of intelligent payment routing, transaction failover ensures that processing errors don’t always mean declined payments. If the optimal acquirer is unable to process a transaction, gateway providers that work with multiple acquirers can route the transaction to a secondary acquirer and ultimately save the day—er, transaction. Learn more about how global payment systems help merchants accept payments online. The cliche “the more, the better” really does apply when it comes to online credit card processing. More shoppers will see the checkout process through if your site accepts credit cards that match their preferred payment method—which means you need to offer more. Using a method customers are familiar with makes any transaction easier and more convenient, and helps people feel more comfortable during checkout. Eight percent of shoppers abandon their shopping carts because there were insufficient payment methods offered by the merchant. The online payment system you choose should support shoppers everywhere by giving them the option of paying with their preferred method. This goes beyond simply offering online credit card processing. Alternative payment methods3—including digital wallets like Apple Pay, MasterPass, and Visa Checkout as well as ACH, Alipay, PayPal, and more—are quickly becoming an integral part of the payments ecosystem. Consumers like digital wallets (essentially a digital version of a physical wallet) because they make checkout faster, easier, and more secure. And with new options presenting regularly, your online payment service provider should be proactive about monitoring the market and frequently extend its support to include a wide range of alternative payment methods. The same is true for cross-border payments. Most countries have payment methods that are unique to their region. For example, 74% of shoppers in Brazil use local credit cards; in Germany, shoppers favor bank transfers6 over credit. As a merchant, if your services don’t support global payment options, you could be losing up to 13% of international shoppers. When it comes to cross-border eCommerce, accepting payments online means accepting all kinds of payments. If your business uses recurring credit card billing22 and invoicing, it’s important that your online payment service provider has a strong subscription management solution so you can easily accept those payments online. Automated billing management. To accept subscription sales payments online, you’ll need a robust management system that supports multiple payment types; you’ll also want it to be flexible enough to allow you to make changes in your subscription offerings whenever (and as often as) you like. Customizable billing plans. Your payment service provider should offer both custom and predefined billing plans so you can choose your desired billing frequency, whether it’s weekly, monthly, yearly, or a custom time frame as determined by you. Global optimization. Your payment provider should support subscription billing for numerous international payment methods, allowing you to maximize your subscription sales overseas. When evaluating potential payment gateway providers, ask these 10 questions! They’ll tell you everything you need to know. Automated subscription reminders. In addition to automatically handling online credit card processing, your subscription billing engine should be able to send reminders to customers using alternate forms of payment, in cases where the transaction must be initiated by them. Those customers will receive automated reminder emails with a link to confirm or renew the subscription, and enable you to accept the payment online. Retry logic for failed recurring payments. You won’t lose track of failed subscription payments if your payment gateway employs automatic retries to follow up with customers. Learn more about how to accept payments online for subscriptions. More consumers are shopping online than ever before, but that good news seems to be coming at a price—eCommerce fraud is also on the rise. In 2016, eCommerce fraud was at an all-time high, occurring at a rate of 33%. Small and large businesses alike are at risk of attack every time they accept a payment online. And it’s not really a matter of if anymore, but when. Businesses that fall prey to fraudsters incur chargeback9 fees and penalties, lose merchandise, and risk damaging their reputations, all of which can severely threaten a company’s survival. What strategies do you employ in fraud prevention? Do I have any control over my fraud prevention strategy? Do your fraud prevention mechanisms also protect global transactions? How can you help me manage chargebacks? If I want to integrate with you via payment API, how can you help me protect shoppers’ payment card information? Do you utilize data to help prevent future fraudulent attacks? Every business is different, so talk through your fraud protection options with your service provider before signing up. The more powerful your payment provider’s fraud prevention strategy, the better your chances of success. Learn more about fraud prevention and security for online credit card processing. By now it’s probably pretty clear that how you accept payments online is only half the battle. Sometimes it’s the small things that make a big difference. Below are a few features we think fall into the category of “little things, big impact” when it comes to accepting payments online. Coupons. Who doesn’t love a coupon? Not only will adding coupons to your checkout page increase customer retention, it also helps attract new shoppers and increase sales. You should be able to easily set up coupons and even change the parameters for their use, like one-time coupons to reward repeat customers or giving discounts to the first 100 shoppers. License keys. If you’re accepting payments online for digital products, you may want to control access to your products with license keys. Your online payment service provider can help support those efforts by delivering license keys to your customers after they make a purchase. Shopping cart/product catalog. Some online payment systems offer merchants the capability to produce a product catalog and set up a shopping cart feature for customers so you don’t have to add yet another company to your mix of technology vendors. That means you can set up a catalog complete with product details, images, and descriptions and give customers a digital “shopping cart” to fill—and your products and payments remain all in one place. These days, everyone’s talking about data, and for good reason. It holds the answer to important business questions that, in the case of eCommerce merchants, can impact your business operations. For example, you might wonder, “Which of these subscription options is performing best?” or “How is my business doing in Brazil?” Data also gives you insight into your customers—i.e., “What device are most of my customers ordering from?” or “Where are most of the sales of a specific product taking place?” Every time you accept a payment online, you gather more useful insights for big questions like these, as long as you have a way of extracting the relevant data. Ask any potential payment gateway provider what level of reporting they provide and if you can access the various types of reports on your own. The information you’ll gain will be invaluable for steering your company toward future success. Learn more about payment analytics in online credit card processing here. Your payment processor should have live tech support available if you need it. In some cases, you may even get a dedicated account manager that you can call anytime with a problem. If you have trouble utilizing a feature or implementing something new, the account manager should be able to bring someone on the call to help, whether it’s a product manager or a developer. Easy access to the in-depth knowledge of support personnel will enable you to turn on a dime should you need to. Find out how BlueSnap can help your business realize its full payment conversion potential—let’s talk! A lot of factors go into making a successful business; by now, we hope it’s clear that how you accept payments online is definitively one of them. Many business owners start out searching for a simple way to accept credit card payments on their websites and settle for a basic credit card gateway provider that does little to help them grow. But credit card processing is just one component of an online payment system. As an eCommerce merchant, even your “basic” needs are actually much more complex than they seem. Plus, your business will, inevitably, change over time. You’ll broaden your horizons in more ways than one—develop a new subscription business model, launch a mobile app, or maybe sell new products in other countries. As your payments become more complex, you’ll need much more than what a simple online credit card processing company can provide. Look for a payment gateway provider that has the capability to support your current and future needs—so you can stay focused on building your business. Still have questions? Check out our blog, where you’ll find a little bit of everything related to online payment processing, or contact us—we’re happy to help! Automated Clearing House (ACH)—An electronic network for transferring funds. It’s different than a wire transfer in that it involves a clearing house that approves a batch of transactions rather than an individual bank-to-bank process. Acquiring Bank—Sometimes called an acquirer, a bank or a financial institution that processes credit or debit card payments on behalf of a merchant and is licensed to settle funds to the merchant. Alternative Payment Method—Payment methods that are used as an alternative to mainstream credit and debit cards. Some examples would include wire transfers, online banking methods (such as SOFORT and Giropay), and digital wallets. Application Programming Interface (API)—A set of protocols and tools that determine how one application can communicate with another. Authorization—Verification of the validity of a shopper’s card (credit or debit) and the available balance on the shopper’s line of credit. Bank Transfer—A general term used to represent a wide range of payments that are credit transfers, such as cash payments, giropay, and wire transfers. These transfers are always made through an associated bank. Capture—A merchant submission for payment from the issuer on an authorized transaction after the goods/services have been rendered to the shopper. Card Not Present—A transaction in which a card (credit or debit) is physically not present at the time of the sale. The merchant does not see or swipe the card and no shopper signature is obtained. These transactions are typically done online or via the telephone. Chargeback—The process initiated by the cardholder when they contact their issuing bank to dispute a transaction on their account. Once initiated, the funds are debited from the merchant and returned to the shopper. A chargeback can be initiated for reasons such as fraud, goods damaged/not received, etc. Credit Card—A plastic payment card accepted as a payment method by merchants. Users are able to pay balances off over time, with interest added to the outstanding balance. Cross-Border eCommerce—Transactions that involve shoppers buying online from merchants in other countries. Debit Card—A plastic payment card linked to the cardholder’s bank account. When a debit card is used as the method of payment, the funds are immediately taken from the shopper’s bank account. Digital Wallet—A secure environment that allows a person to store multiple payment cards and bank account numbers. This eliminates the need for customers to enter their account information multiple times when making a payment. Examples of digital wallets are Apple Pay and Visa Checkout. Gateway—The service that automates the payment transaction between the shopper and an online merchant. The payment gateway is the connection that allows a merchant to accept credit card and other forms of electronic payment. Intelligent Payment Routing—Automatic transaction routing between multiple acquiring banks to assure a maximum success rate, including failovers and subscription retries. Issuing Bank—A financial institution that issues credit and debit cards to customers. Marketplace Model—A type of business model that brings products or services from various vendors together under one umbrella. Merchant Account—An account that enables merchants to process customer credit and debit payments; it’s where the merchant’s funds are deposited after the successful completion of payment card transactions. Mobile Payments—Usually refers to payments completed via a mobile device. However, the payment methods and the technology used to pay could be many: mobile wallets, single card NFC payments, alternative payment methods such as bank transfers, etc. Payment Card Industry (PCI) Data Security Standard—A set of requirements designed to ensure that all companies that process, store, and/or transmit credit or debit card information maintain a secure environment. Payment Processor—A company (often a third party) appointed by the merchant to submit payment transactions. Recurring Billing—Allows a merchant to charge a customer’s credit or debit card on a regular basis for recurring services such as membership fees or subscriptions. Refund—A credit to a cardholder, usually due to remediate the return of goods or services. Settlement Currency—The currency the merchant receives funding in. Underwriting—The process of taking on financial risk associated with a venture; it involves assessing the creditworthiness of the party in question. Wire Transfer—An electronic payment service for transferring funds by wire; for example, through SWIFT, the Federal Reserve Wire Network, or the Clearing House Interbank Payments System. Previous Story What Can You Do With BlueSnap’s New Mobile App?